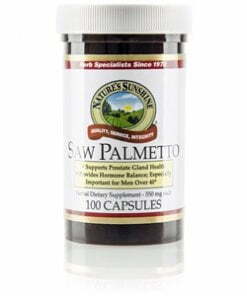 Scientifically proven to promote prostate health, saw palmetto helps the body balance hormone levels, especially in men forty and older. In addition to prostate benefits, it may also support other glandular tissues and may boost immunity. Nature’s Sunshine Saw Palmetto comes in 550 mg capsules.